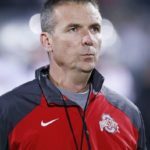 Ohio State coach Urban Meyer was suspended for 3 games for how he handled the domestic abuse allegations against his assistant coach Zach Smith. Meyer held a press conference Wednesday night apologizing to the University for how the situation was handled. He never admitted, however, he knew anything about the years of abuse Smith’s wife, Courtney, suffered, even though Courtney shared her suffering with Meyer’s wife via text messages. Meyer even knew there was a police investigation. Many are upset with Meyer’s lack of emotion and contrition during the press conference, never mentioning Courtney’s name or her years of suffering.